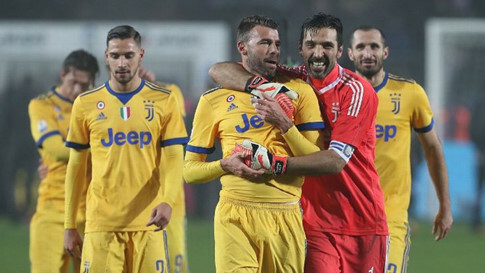 Gianluigi Buffon saved a penalty - which resulted from the use of VAR - as Juventus stayed on track for a fourth straight Italian Cup triumph with a 1-0 semi-final, first leg win at Atalanta. Buffon - making his first appearance in goal since turning 40 and after a two-month layoff with a calf injury - showed he was back at his best as he made his first cup appearance since 2012. The holders got on the scoresheet in Bergamo after just two-and-a-half minutes when Argentine striker Gonzalo Higuain muscled his way through the Atalanta defence and curled a shot past Marco Wolfli into the corner of the net. Atalanta had the chance to level when the video assistant referee (VAR) awarded a penalty after Medhi Benatia handled in the box, but Alejandro Gomez's spot-kick was saved by the evergreen Buffon, who dived low to his left to keep out the drive. Higuain missed a chance for a second after half an hour and two Blaise Matuidi efforts were deflected over the bar, but Buffon again saved two quick-fire attempts from top Atalanta scorer Gomez after the break, tipping over the second. Higuain came close late on and Buffon again saved his team three minutes from time when he blocked Andrea Petagna's point-blank shot. But despite beating league leaders Napoli at the San Paolo Stadium to advance to the semi-finals, Atalanta could not find a way past Juventus who controlled the game. Speaking after the game, Juventus coach Massimiliano Allegri said the narrow victory was an important one. "I am glad we honoured the Italian Cup again this year," he said. "I'm happy for Gigi (Buffon), who hadn't played in the Italian Cup for five years," Allegri added. "He hasn't forgotten everything he knew just for being out of action for 45 days. "He had a rest for a few weeks, perhaps he needed to put his feet up, but he's back now and he's our first-choice goalkeeper. Wojciech Szczesny did well in his absence and is a champion, but Buffon is Buffon. "It's an important result, although nothing is decided until the second leg." Allegri's men now just have to maintain their advantage when they host Atalanta in the return leg on February 28 in Turin.